Richmond, Virginia: our Redesigned Network starts June 24! On Sunday June 24, 2018 Richmond, Virginia will wake up to a new transit system, including its first Bus Rapid Transit line — the Pulse. The redesigned network for the whole city is the result of a design process that our firm guided, in cooperation with the local office of Michael Baker International, for the City of Richmond and Greater Richmond Transit Company (the transit agency). The redesign process began in early 2016 with our team leading city staff, stakeholders and the public in a conversation sparked by our Choices Report. We focused on key trade-offs, like ridership versus coverage and the right balance between peak service and all-day service. Importantly, this project was led by the City of Richmond, not the transit agency, so it was closely aligned with the city’s own goals for itself, including its redevelopment. We then developed three concepts of how to redesign the City’s bus network around the new BRT line and guided a conversation around those concepts and the goals they represented. The Familiar concept represented little change. A Coverage concept focused on covering every part of the city even where ridership would be low. A Ridership concept focused more on high-ridership services, like frequent lines in high-demand corridors. Response from the public and stakeholders leaned toward the Ridership concept, though there was a wide diversity of opinion. The top map shows the original proposal for the east end of the city. Red = every 15 minutes. Blue = every 30 minutes. Residents told us they preferred shorter walking distances and lower frequency, so we revised the proposal to the map below. By January 2017 we published a draft recommended network with six new high frequency lines in addition to the BRT, clockface frequencies, more through-routing (instead of terminating) downtown, and a network that maintained nearly all existing coverage of people and jobs. While response to the draft recommendation was very positive, the East End of the city raised some concerns. We had designed a high frequency line (Route 5 in the map) that required a longer walk for some residents. After more thought and review, the community and the city decided they would prefer to have shorter walks and longer waits. So, we revised the network design to have two lower frequency lines (Routes 5 and 41 in the map) instead of one higher frequency line. We published the final network plan in March 2017 and since then the City and GRTC have been working hard to prepare for the big day when everything changes overnight, including additional tweaks and updates to the network in light of new information and additional community feedback. But overall, the basic network structure that will be implemented on June 24 is what was in the final plan from March 2017. 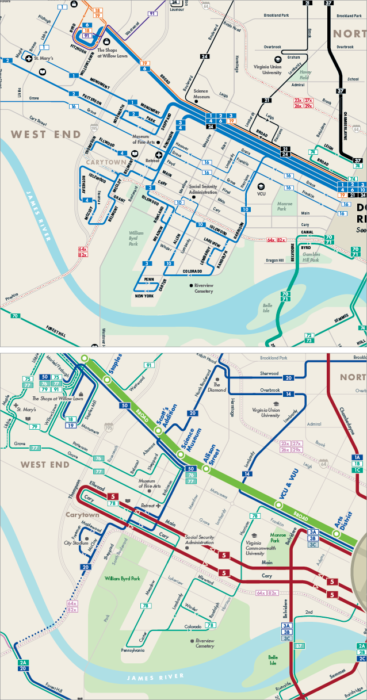 The top map shows the network before the redesign and the lower map shows the network after the redesign. map to the new map in near west part of the city, which includes the Fan and Museum District neighborhoods. Previously, many routes piled together onto Broad Street to create a lot of service there, but it was not well organized and led to more bunching of buses than useful frequency. The new network is radically simpler, with more direct lines and frequent lines focused on the major east-west corridors in this part of the city. So there are now two major frequent lines in this area, the BRT line on Broad Street and the frequent Route 5 on the Main/Cary couplet. And there is a new orbital line (Route 20) connecting the north, south and west parts of the city without requiring a transfer downtown. This is really important for Richmond because of the prevalence of jobs in the western part of the region while most lower cost housing is in the north, south, or east. We wanted this line to be every 15 minutes, and we hope it will be soon; for now, budget constraints are holding it to a 30 minute frequency. Throughout the process we led the network design and guided the stakeholder conversations. We worked closely with our local partners at Michael Baker International who led the public outreach and key local government coordination. And the City provided strong leadership throughout to ensure the process led to a clear and convincing direction when City Council unanimously approved the policy direction for the plan in February 2017. We’ve had fun working with GRTC, the City and surrounding counties on a ten-year plan for transit improvement. We’ve been leading an intensive effort on the network design in Henrico County, which covers Richmond’s northern suburbs, including concepts for a major expansion of transit into the county. That is all leading toward a new Transit Development Plan for GRTC which will be completed in the next few months. Meanwhile, Henrico County has already taken major steps to implement parts of the plan. 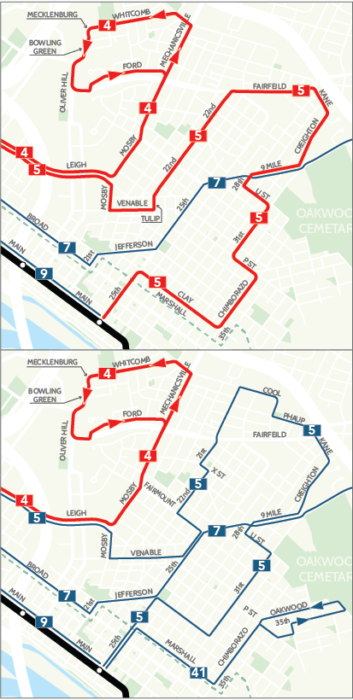 Starting in September, there will be evening and weekend service on three routes in Henrico (currently they do not have any service in the evening or on weekends). They will also extend service to the airport and along West Broad Street to Short Pump to serve the one of largest suburban office parks in the region and the largest shopping mall in the region. When local governments start leading on transit, big things can happen. The fast movement on so many fronts in the last two years is due, in part, to the City of Richmond and Henrico County taking a much stronger role in guiding and planning for transit in coordination with GRTC, instead of leaving all the advocacy to the transit agency. We’re pleased to have helped shepherd the conversation to this point, but much credit goes to all the GRTC, City, County, State, and regional agency staff (and other supporting consultants) who have worked hard on these issues for years and to the local transit advocates and organizers who have built grass roots support for more transit across the region. So, get excited, Richmond and Henrico, for your new transit system is coming soon. And for those of you from other places who are interested in experiencing a transit redesign first hand, perhaps you should plan a long weekend trip to Richmond for the June 24 opening. You could even volunteer to help with the changeover! What is “Development Oriented Transit”? Is Anyone Owed a Transit Line? 17 Responses to Richmond, Virginia: our Redesigned Network starts June 24! Wow, that would drive me NUTS. People not willing to walk a couple extra blocks to gain 2x the frequency? Idiotic. I wouldn’t say “idiotic”, but I certainly would prefer more frequency and less walk. I don’t think it’s exactly “selfish” when it’s a cost to yourself as well as a benefit to yourself. It’s just an expression of particular desires. For everyone there is *some* tradeoff of proximity and frequency that would be reasonable. It’s not clear that would be the same tradeoff for everyone. Regardless of what some residents may say, studies show most transit riders will only walk up to 400 meters (5 minute walk). Transit use greatly diminishes over 400 metres from a stop. And it makes sense. Are you willing to walk 10 minutes to get to a bus stop, to get to a place that may only take 10 minutes to get to in a car? If your concern is exclusively travel time, you’re probably not riding a bus anyway. Even assuming the stop is literally outside your front door (in other words, a 0 min walk), there are very few O-D pairs in Richmond (or any other city) that are a 10 min drive in a car and also a 10 min or less ride on the bus. A more realistic question would be “Are you willing to walk 10 minutes to get to a bus stop to get to your destination 50 minutes later (10 min walk + 10 min wait + 30 min ride), or would you prefer to walk 5 minutes to get to a bus stop to get to your destination 65 minutes later (5 min walk + 30 min wait + 30 min ride)?” The destination is probably 10 min away in a car no matter what the bus frequency and travel time is. If I lived 5 minutes away from a bus stop on a route with a thirty minute frequency I would time my departure from home so I didn’t have to wait 30 minutes at the bus stop. For example last week I walked for 20 minutes from my home to my town centre bus station to catch a 20 minute frequency service. I timed my walk so I arrived 5 minutes before the next departure. The bus arrived and departed on time, so minimal waiting involved. As Jarrett says, waiting can happen at the beginning or end of the trip. If you need to get to work at 8am sharp (in practice, most employers would give you a little bit of leeway), and the bus arrives at 7:32am or 8:02am, you’re forced to wait 28 minutes at your destination. I have to ask- why the through running instead of terminating? Here, in Warsaw, through lines are usually replaced with two down-town terminating lines in order to prevent delay propagation from one side of the city to the other. It depends on the total length of the run, congestion conditions on each half, and whether the two halves are balanced (similar volume so needing similar frequency). In Seattle some through-routes have been split, others have been split and reconnected to other routes, and others remain long-term even through route reorganizations. The city asked the agencies to reduce the number of layover spaces downtown so the land could be put to a more active use (sidewalk, bike lane, etc). Through-routing also saves service hours and buses, allowing more frequency for the same cost. And it doubles as a circulator route through downtown and the adjacent neighborhoods without requiring a transfer in the middle. In some cases it’s not a true through route but simply going all the way through downtown to an adjacent neighborood, so that the same route can serve its original market, and as a downtown circulator, and as new service between downtown and the terminus neighborhood. I used to think ten-mile through-routes were silly because what’s the likelyhood that somebody is going from that northern route to that southern route rather than any of the other southern routes. But over the years I’ve found them more and more useful. Because if I’m going to some point on the southern route and I’m further east, it’s not any more difficult to go west and transfer to the through route there rather than transfering downtown. And sometimes it’s more pleasant to transfer somewhere outside downtown, because downtown has peak-hour congestion and scummier waiting areas. It ocurred to me that Richmond does not have a strong rail transportation, which may be the reason for the difference in approach. In Warsaw metro, railway and trams all go from one end of the city to the other and buses necessarily supplement the service where there are no rails or serve as feeders. So you are right- through running is more convenient, it’s just provided differently here than in Richmond. The east part of Richmond is hilly, and the summer heat can be fierce. If I lived there, I might trade frequency for less uphill walking. I live car-free in Alexandria, Virginia, which also has plenty of hills and hot weather, and in the hot months I try to arrange my bus travel so that the walking portions of trips will be downhill if possible. I live in Richmond and no one needs to climb a hill to get to a bus stop. Everything is built on top of hills, which are very flat once you get up on them and the lowland between the hills and tthe river is well served by transit. Not terminating downtown is very important. Richmond is not very big and living in the east end i can walk downtown in ten-twenty minutes. So taking a bus there and transferring feels like a waste of time. Moreover there are very few entertainment, shopping and service (doctors etc. )options downtown. Most are on the west end so that’s where i need to go. It takes me twenty minutes to bike there but fifty minutes to take two busses under the old system. So I never take the bus. Very excited about this redesign as it makes the bus more useful and easier to understand. Seriously, i had a hard time figuring out some of the routes and where the stops are. Hey Jarrett. What percentage of their budget went to coverage and what percentage went to ridership? This plan looks great, and seems to finally be on of the bus redesigns which did not strand whole parts of the city without transit, but instead maintained existing coverage to a great extent. Great job. First time I’ve been through your reports and I like how the thought process is spelled out, one page after the other. I note that a lot depends on having disaggregated data, which you might have in the States, but it is not always the case. How do you manage to build your case and define a network in the absence of detailed data on populations, jobs, poverty etc? 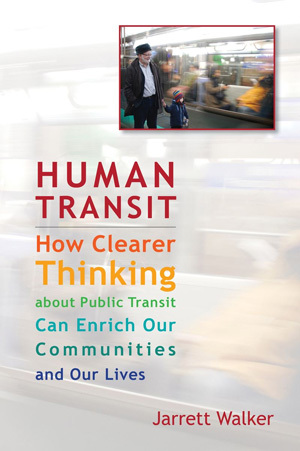 Transit should be providing good service to everyone, and focusing on poor areas does nothing, because poor people don’t just stay in poor neighborhoods. One could argue the American way of planning transit, with only focusing on poor neighborhoods, creates bad transit outcomes. And it shows in the data. You should be planning transit to be great for everyone, and that in turn helps low income residents. Home › General › Richmond › Richmond, Virginia: our Redesigned Network starts June 24!